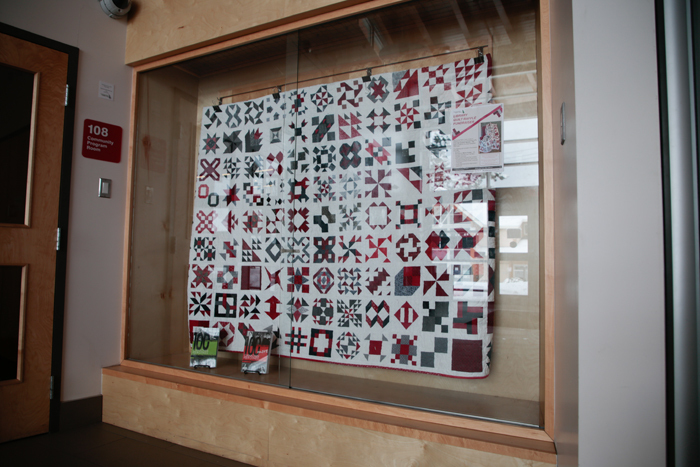 The quilt, donated by the Stitch Dimension Quilt Guild, is on display at the Library and will be raffled off on March 9. Salt Spring Public Library fundraising efforts take a warm turn this winter thanks to a donation from the Stitch Dimension Quilt Guild. The island-based group has presented the library with the result of a special group project called 150 Canadian Women — The Quilt, to be raffled off on March 9. The final date to buy tickets falls on International Women’s Day, a fitting time to recognize the contributions of the historical figures commemorated in fabric art. The local project was inspired by quilter Kathryn (Kat) Wilson Tucker of Calgary, who created the design for Canada’s 150th birthday in 2017. “When members of Salt Spring’s Stitch Dimension Quilt Guild learned of this project, we immediately thought it would be a perfect group undertaking. It could be broken down into ‘bite-sized’ pieces, it accommodated a range of stitching abilities, there were challenges to be met, and it was illuminating to read about fellow Canadians along the way,” said Stitch Dimension Guild member Liesbeth Leatherbarrow, who coordinated the project. Tucker’s pattern features a different type of quilting style in each individual six-inch block. She originally released three block patterns each week on her website, along with the corresponding one-page biographies of the historical women she had selected to celebrate. Tucker made the entire collection available for purchase at the end of the project. Leatherbarrow said while the guild members often donate their work to non-profit organizations they seldom do a single project together, so finding Tucker’s design was a fun experience. Tucker decided on which pioneering women to include using two books by Merna Forster: 100 Canadian Heroines and 100 More Canadian Heroines. She matched traditional (and wonderfully poetic sounding) patterns to the women for each block. For example, Geraldine Moodie gets Friendship Star, Harriet Brooks has Shoofly, and Pitseolak Ashoona is represented by Squash Blossom. Leatherbarrow assigned the blocks to the guild members in more random fashion. Each worked on 12 or 13 blocks on their own time through the course of a year. While Tucker’s original design featured just red and white, the local guild updated the project to include black and grey, raiding their own fabric stashes for suitable material. The group worked together on assembling the blocks, and the long-arm quilting was done at Sweet Pea Quilting in Parksville. After deciding to take on the project, the guild was pleased to find a good match for donation in the Salt Spring Public Library, where head librarian Karen Hudson is a big quilting fan. A few of the quilters are also library volunteers, and another quilt the guild donated hangs on the library wall. A limited number of 300 raffle tickets are being sold, and the prize potential is enormous compared to the minimal ticket price. In addition to a handmade artwork crafted over countless hours, the winner will receive Forster’s two books on Canadian heroines and a guide to the quilt’s history that includes an index showing each block’s placement, pattern style and the woman commemorated. Tickets will be available at the library up to March 8 at 5 p.m. (unless they sell out earlier). The draw is set for Saturday, March 9 at 10 a.m.